Guatemala is known for delicious coffee, especially from the region of Antigua. 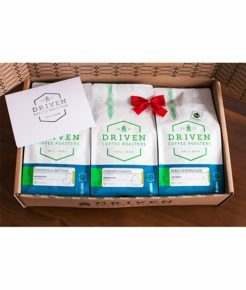 That is why we have chosen to offer this coffee – it is complex, rich, and unique, an all-around pleasing cup with a fragrant aroma. Coffee was introduced to Guatemala in the 1850’s. Over the years, the region of Antigua, in the central highlands of Guatemala, seemed to produce especially delicious coffee. Antigua is actually a city, at one point Guatemala’s capital, that is known for beautiful Spanish Baroque architecture among its historical buildings, such as churches and convents, and many tourists visit Antigua from cruise stops. The valley is surrounded by three volcanoes, Volcán de Agua (DzVolcano of Waterdz), Acatenango, and Volcán de Fuego (DzVolcano of Firedz). The valley and mountain slopes are rich in volcanic soil, thanks to these volcanoes. Occasionally, Volcán de Fuego, one of the three active volcanoes in Guatemala, erupts mildly and lays down fresh ash, which helps the soil gain more minerals. And coffee plants thrive in volcanic soil, not just because of the minerals, but also due to the water retention properties it holds. The tropical forest is very dense, which helps protect coffee plants grown at high elevations from any frost that may fall. With high elevation, volcanic soil, high humidity, rain, and shade from lush tropical forests, Antigua proves to be an excellent home for coffee. Guatemala Antigua has full body, and its flavorful tones of lemon, chocolate, honey, and spice make a pleasing, elegant combination. We roast it to a medium level to bring out the sweet tones in the beans. With its medium acidity, Guatemala Antigua a balanced, complex coffee that many coffee connoisseurs love to drink.